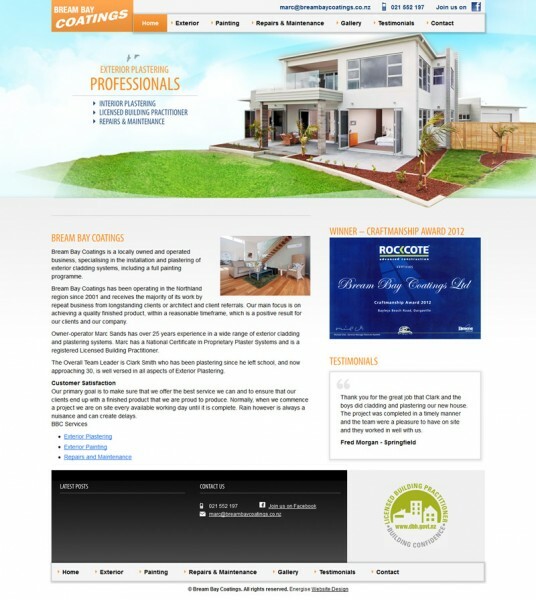 Bream Bay Coatings is a locally owned and operated business, specialising in the installation and plastering of exterior cladding systems, including a full painting programme. Bream Bay Coatings has been operating in the Northland region since 2001 and receives the majority of its work by repeat business from longstanding clients or architect and client referrals. Our main focus is on achieving a quality finished product, within a reasonable timeframe, which is a positive result for our clients and our company. Owner-operator Marc Sands has over 25 years experience in a wide range of exterior cladding and plastering systems. Marc has a National Certificate in Proprietary Plaster Systems and is a registered Licensed Building Practitioner. The Overall Team Leader is Clark Smith who has been plastering since he left school, and now approaching 30, is well versed in all aspects of Exterior Plastering. Our primary goal is to make sure that we offer the best service we can and to ensure that our clients end up with a finished product that we are proud to produce. Normally, when we commence a project we are on site every available working day until it is complete. Rain however is always a nuisance and can create delays.